This is BK-40 that I finished in late October of 2013. 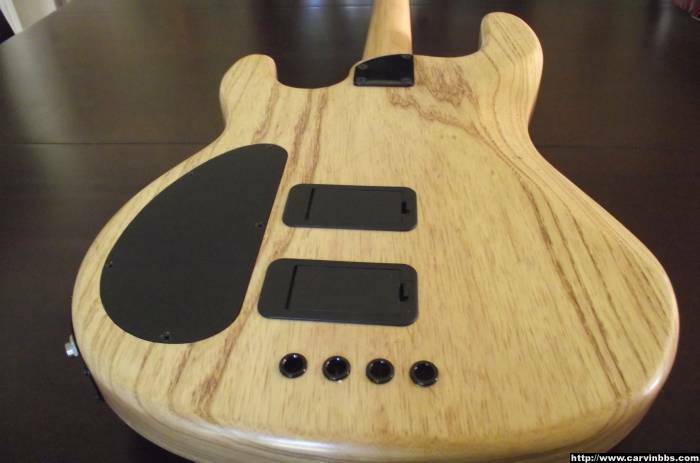 Options ordered were the swamp ash body, SB-style headstock, stainless steel medium jumbo frets, maple finger board , active electronics and black hardware. The body was grain filled with 50/50 mixture of ash & mahogany filler from Stew-Mac. I put down about 10 coats of Birchwood-Casey Tru-oil. After that set up I then decided to spray it with about six coats of satin finish Deft nito-cellulose laquer. Buffed it out with 000 steel wool and 3M Scotch Brite white pads. It came out better than I could ever imagine. The thing that gave me the biggest headache was getting my headstock decal buried. Ow, wow! Nice job. That came out looking great. I'm afraid if I tried something like that that it would come out rather "rough". Yes indeed...that looks like a factory built bass. Really nice work and congrats! That grain has a lot of character. Love the natural finish. 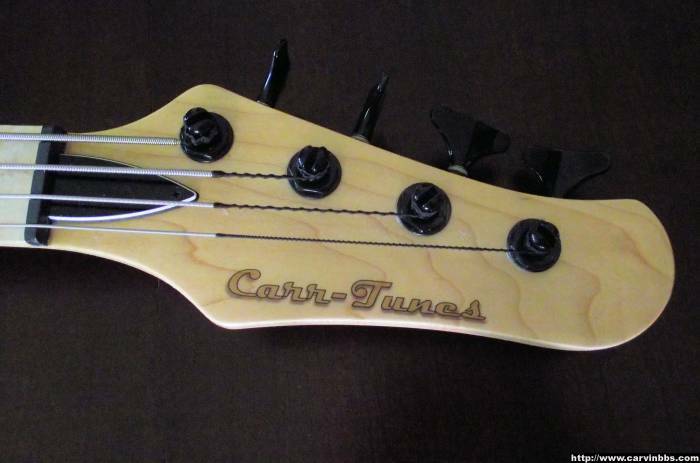 Can you tell us what the headstock says? @ Coda, It says "Carr-Tunes" It's kind of a a play of words on my last name which the first four letters are "Carr" and Carvin. As i mentioned in my original post that's what gave me the most grief...getting the decal buried. That looks awesome.....Tru-oil is great stuff.!!!! That's a beautiful finish! 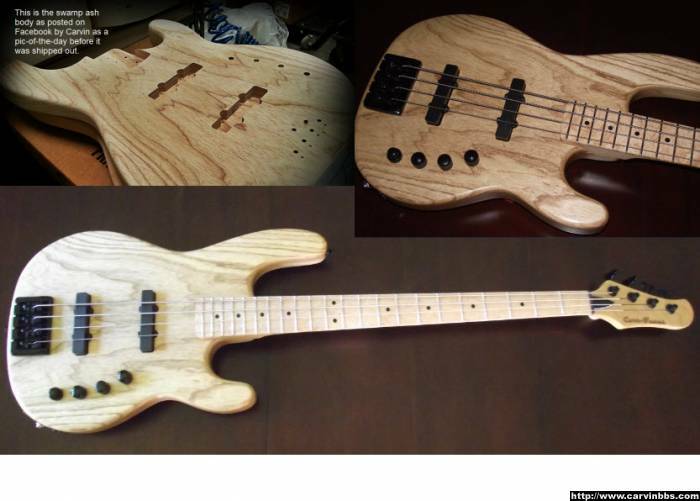 I was thinking of something along those lines as well, but my bass is coming with an alder body. 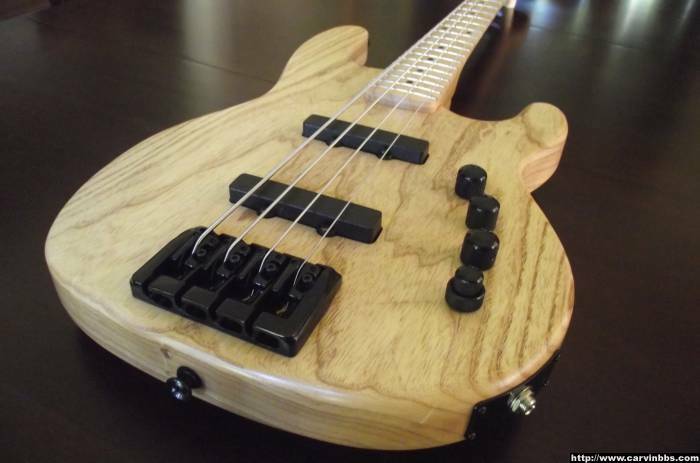 That swamp ash grain looks great! I'm curious to see what the alder grain looks like. I've seen YouTube videos on filling in the grain to enhance it, is it difficult to do? roncarr wrote: @ Coda, It says "Carr-Tunes" It's kind of a a play of words on my last name which the first four letters are "Carr" and Carvin. As i mentioned in my original post that's what gave me the most grief...getting the decal buried. I hope she's still treating you well! This one showed up on the scene before I did. Still, I'm glad It returned, so's I could groove upon its glory. That came out great! Gotta love those kits!